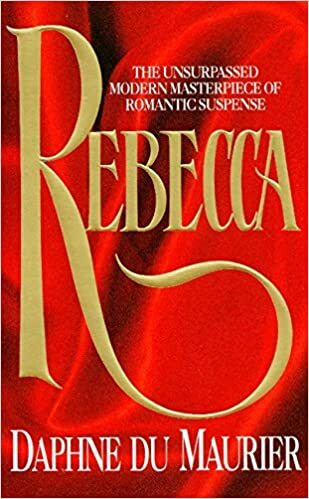 I've never read Rebecca and I thought it was high time that I did. And what better day to post about it than on du Maurier's 109th birthday? As I started reading this classic novel I realized that while I knew that Rebecca is the name of Maxim de Winter's dead wife, and that the story revolves around his new, young wife who remains unnamed throughout, and that it takes place at Manderley in Cornwall, I didn't know much about the story itself. Only that it's a modern Gothic. Oh, and I knew about the infamous Mrs. Danvers and her unkind treatment of her unnamed heroine. (Mostly because two of the main characters in Barbara Michaels' novel Into the Darkness discuss her at length.) So needless to say, I was curious about the rest of the story, and eager to know what the fuss is all about. First of all, I have to say that I really like the way du Maurier writes: her descriptions of Manderley, her voice, and the way she sets a scene. She's good at building suspense and she also writes very memorable characters. I think it's impossible to have lukewarm feelings for Maxim and his new wife, or Mrs. Danvers. Or Rebecca herself. I either loved them, or hated them...or desperately wanted to slap them, which shows how invested I became in their lives, and in this story. There were times I got a little impatient with the pacing. And I got a little impatient with Maxim and his young bride, too. I wanted them to solve their miscommunications more quickly. But that's just because I wanted them both to be happy. All in all, I really liked this book. And I'm glad I finally got around to reading it (and that I finally know how it ends!). Now I can happily cross it off my "To Read" list and add Daphne du Maurier's name to my list of favorite authors. I'm glad you finally read it! Have you seen the movie? It's great too. I haven't seen the movie, but I want to! I've never seen the movie, but I read this when very young and still have an image of the return to Manderlay and the rhododendrons (which at the time I had no idea that azaleas were of the same genus and could easily be substituted in my vision). It's a memorable image, isn't it? Rebecca is one of my favorite books, I am glad you also liked it very much. There is the film, but also a recent mini-series with Emilia Fox and Charles Dance and Diana Rigg as Mrs. Danvers. It is quite good! I am also reading Daphne Du Maurier, just finished the short stories in the The birds, and almost finished the historical novel The glassblowers. I think the short stories are something you will like as well! I love Rebecca so I'm pleased you've read it and enjoyed it. Daphne du Maurier is one of my favourite authors and I've been working through all of her novels over the last few years. If you want to read more of her books My Cousin Rachel might be a good one to read next. Ooh, I loved Rebecca! So atmospheric! I read her other book, Jamaica Inn, which was equally good but not in par with Rebecca. I've My Cousin Rachel in my pile but haven't got around to it. I felt the same way -- that I wanted to have read Rebecca -- so finally I did! It proved a great discussion book, too.